A Marketing stack is the collection of marketing technologies used by a company to achieve its marketing objectives. The topic is becoming a big deal as the number of technologies available to marketers increases as does the proportion of the tech budget that marketers are in control of. 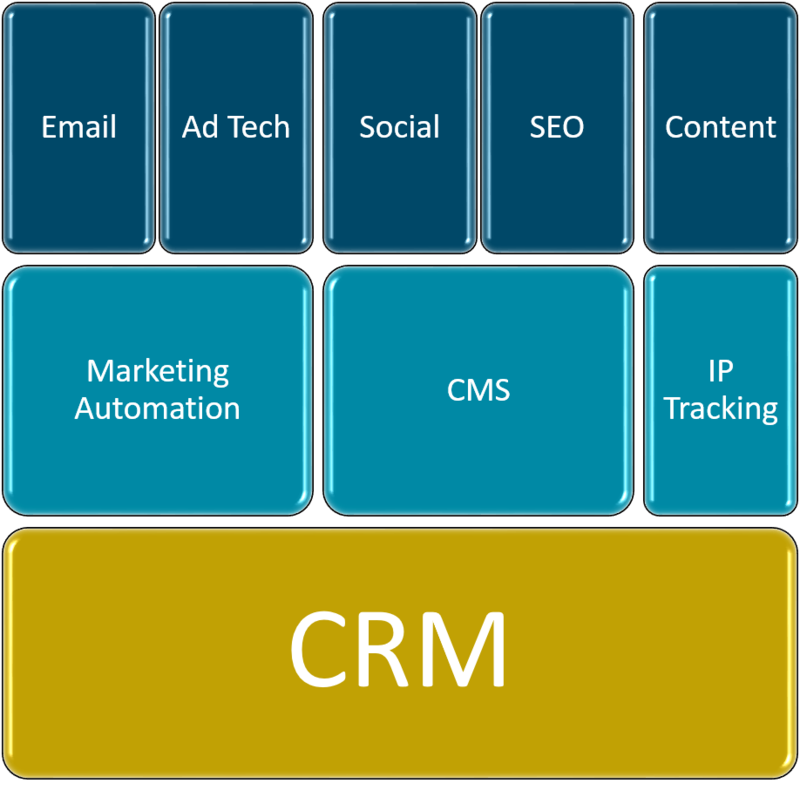 What is a B2B Marketing Stack? If you haven’t yet heard the phrase ‘MarTech’, consider this your introduction. If you work in marketing, I believe it will affect all of us within the next 12 months. Much as data analysis has become a necessary skill for marketers, having an up-to-date knowledge of existing marketing technologies, how they work, and if they are worth it – is going to become the new normal. What does the Marketing Stack mean for me? Back in 2011 a Marketing Technology Stack was mainly something for the CMO’s and CIO’s of international corporations to debate and choose between. Jump forward to today and every company has a marketing stack, even if they don’t realise it yet. With a customer database, an email marketing solution and a website powered by a CMS you already have a three tiered stack. Why your marketing stack matters is easy. Is your email marketing solution integrated with your customer and/or lead database/CRM/Marketing Automation solution? If it isn’t, the data coming out of your email marketing solution is certainly not as useful. How often are you emailing information at the wrong time to the wrong people? If you don’t plan your Marketing Stack now, what will happen when you are using a ten-tiered stack? Building your stack does not mean immediately going out and buying lots of expensive tools, that you may not have time to use anyway! 3. Deciding how to combine the data across the various solutions. Let’s say you have a CRM, or a Lead Management tool, and an Email Marketing Tool. In your CRM/Lead tool you have contact details of people you either currently do business with, or would like to do business with. It’s easy to export this data and add it into your email tool as a list. Now you can send campaigns to them. Using click through data you score the contacts based on how well they interact with your emails. You’d like the top 10% to be followed up by your sales team. Now you hit a problem – all of the interesting data is in the email marketing solution. You sales team only have access to the CRM/Lead Management tool. Now you need to summarise information, export what you can, import it back into the original tool, then finally pass it to the sales team. The real dilemma – do you keep emailing the top responders? Do you manually check to see what stage of the sales process each of the top responding contacts are at with the sales team before sending each email? And can you fit that in while importing new contacts to the email solution, and exporting more data out to pass back to the sales team. This is enough to make any marketers head explode! Back to integration. Identify the base of your technology stack – this should contain a wide range of data, and be used by as many people across the business as possible. Normally this is a CRM solution in your average medium sized business. For smaller businesses it could be a lead management tool used by sales and marketing. Occasionally Marketing Automation makes up this base component of the stack, but this does cut out the valuable data from your other business teams – finance, service, etc. Once you have a base system, make sure all of your regularly used marketing tools can integrate with it. It is a game changer. Now you can segment your central database of contacts by rules. Once you have your hot leads to pass to sales, they can see the full interaction history right in the central solution they are used to using. And you can pass them on with the click of a button, rather than exporting and importing data. Once you’ve passed them on, you can use the status of the contact to include or exclude them in future email campaigns. Integration makes the whole process faster, safer and easier. Having identified CRM as the obvious choice for the ‘belt and braces’ of your stack, pick one that meets your specific needs. Do you need helpdesk functionality, project management, or integration with your ERP system? A popular buzzword, anyone would be forgiven for thinking Marketing Automation is the only tool a marketer needs! Not true, but it is pretty useful. Make sure it integrates with your key tools, and you should find the processes behind lead-to-sale become simpler. If you have a website, you need a CMS. A CMS allows you to edit a website without directly editing the HTML code. Chances are, most readers of this blog will already be CMS pros – whether that be WordPress through to Drupal and Joomla, or even custom designed by a website agency. Integrating a CMS allows inbound leads to automatically come into your workflow. Email is essential to today’s B2B marketers, and shows no sign of weakening. It’s the cogs in marketing automation, the delivery boy for content and the carries the identifying beacons to help identify website visitors. Email has gotten pretty clever. Combine the tools you need for design with heavy integration to make the most of that data, and you are on to a winner. There’s good old analytics – such as the well-known Google Analytics. It’s useful, we all need it to identify how people reach our website and what they do when they reach it. But it is all macro data, which isn’t that helpful when you are trying to track it down to a granular level. You need it, but I’m not so sure you need to integrate it. Enter Tracking (my nickname for this newer tech, you’ll find many others out there). IP Tracking identifies business website visitors (at match rates of 10-40%). Good for lead gen, but much better for scoring existing leads and customers. Find it, integrate it, you’ll love it! If you are a large company, you might want to look at integrated PPC/affiliate technology to manage budgets, user access, etc. If your marketing department isn’t quite so large – I wouldn’t worry too much. PPC platforms are set up to exist as their own ecosystems. The useful bit is pulling the data in via your web visitors which some MA, email and Tracking providers can offer. As a minimum, ensure you can search hashtags and mentions of your brand. Even if you don’t have a social account. Features beyond that really depend on how important a channel is for you. It’s worth noting that the larger tech areas of the stack may not integrate with the rarer social channels, and that LinkedIn tends to only play nicely with the big boys. Consider this a nod to two giants. If you are really into inbound and the principles behind it – go and read about these, at length! There are so many tech providers in these sectors that it’s become a really specialised game. The larger your tech stack, the more likely you need some of these vendors in there. They are both pretty important for Marketing Automation too! Scott Brinker has been producing the above supergraphic of marketing technology since 2011, when it contained just 150 different products. In the 2016 edition shown above, this has grown to a whopping 3,874 products. New technologies are appearing every day, promising new ways of generating leads, converting website visitors and generating content, amongst others. Believe me, you will reach 10 tiers. 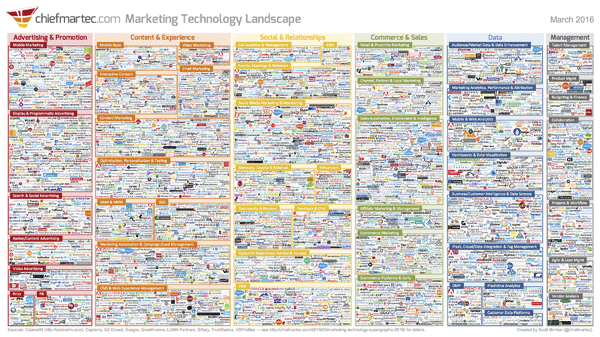 In fact, the average company’s marketing tech stack now consists of 17+ tools. If you don’t consider how they interconnect at the start, you could end up with a lot of employees working in expensive and unconnected silos. And that is without considering other useful customer data you may have in accounting, events and sales software, amongst others. 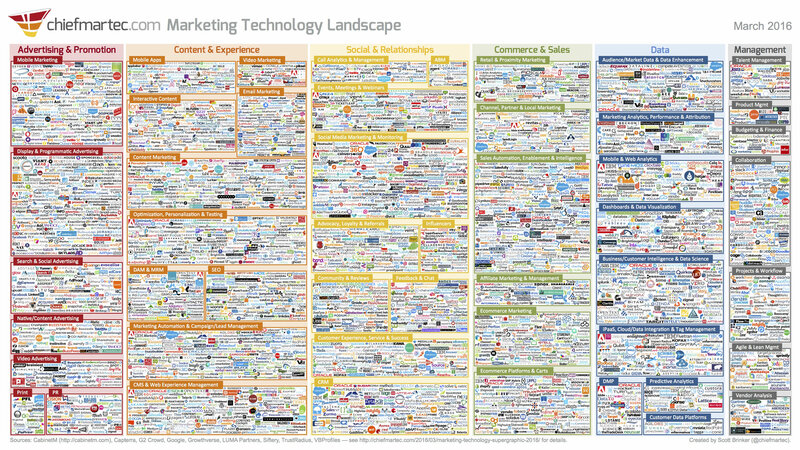 So, what’s in your marketing stack? 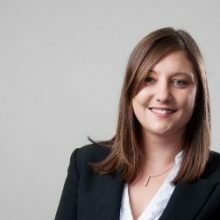 Penni Stanton is the Marketing Manager at Gold-Vision CRM, a software provider focused on improving sales performance and marketing ROI through it’s company-wide Sales and Marketing software. With a specific focus on the marketing offering, Penni develops Gold-Vision’s Email Marketing, Marketing Automation and Lead Scoring solutions.